1) Cold Water Rinse. I know its friggin cold, so get out of the tub and stick you head under the faucet or if you have a shower head that detaches do it that way…. I have looked extensively online and asked a wide variety of my clients and everyone says it works. Not just for the shine, but also apparently it dramatically helps with keeping tangles at bay. 2) LA ladies! Shower filter. Now. No excuses. It will change your hair, skin, and life. In that order. 3) Check your hair dressers color. Not on their head, but what color they’re actually using on YOURS. I know there are lots of tricks and glosses and blah blah but just ask. And then google it. Read reviews. I have never ever found another color line as reflective and shiny as Framesi Framcolor 2001 but I would love to hear if there is one. 4) We’re all broke. But if you’re broke like TRESŚEME broke, then you need to clarify your hair. Cheap conditioners have cheap waxes that make your hair feel soft to the touch but will build up over time and it will be dulls-ville. Since you’re broke, get into the kitchen and grab your dish soap. Not dishwashing detergent– just the liquid dish soap. Wash your hair with that. * Repeat. Condition. This time not with the cheap stuff. My hair is always super shiny after a good clarifying! 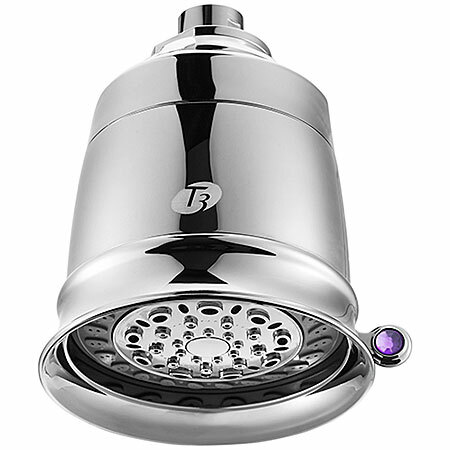 This is a Source T-3 shower filter. You can buy it online. However, Sephora sells it and I trust them more than a random web store, and they stand behind their products.